There is a new superfruit gaining favor and interest and, just like rooibos tea, it originates from Africa. The baobab fruit comes from the famous upside-down baobab tree – called that because it looks as if it has been planted with its roots waving about up in the air. Wonderfully rich in vitamin C, calcium and anti-oxidants, baobab fruit can rightfully claim superfruit status – especially as it has now been approved by the food authorities in both Europe and the USA. 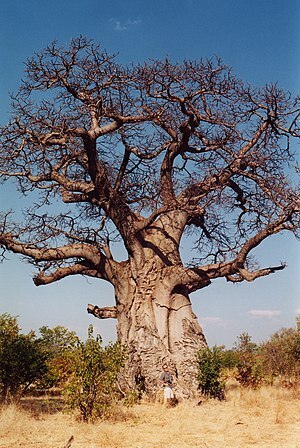 The iconic baobab tree is often called “the tree of life” by the local inhabitants (in different parts of Africa such as Tanzania, Kenya, Senegal, Malawi, Namibia, South Africa and more, as well as the large island of Madagascar off the East coast of Africa) because of its life sustaining benefits. Mysteriously, the baobab tree has no tree rings so no one is 100% sure how old the trees are – hundreds or even thousands of years. As well as providing food, the tree is home to fruit bats, parakeets, weaver birds and lovebirds along with the hawks and owls of the bush that seek out mice to feed upon among the baobab’s roots. Now the seeds and fruit pulp of this superfood are finding their way into international markets via Afriplex in South Africa and Baobab Foods in the USA. As well as marketing its own line of baobab fruit products, Baobab Foods also supplies the fruit pulp to other companies seeking to create their own lines of baobab products. One such product is pure, soluble baobab, called BaoBest Fruit Powder which is suitable for mixing into a wide range of foods and drinks, including smoothies, sports drinks, yogurt and water. Hopefully, this product will remain pure and natural and not get tainted or contaminated with refined and processed ingredients such as high fructose corn syrup. The good news is that Organic Burst Baobab was recently nominated for Best Superfood in VegFest Awards, the largest European vegetarian festival. In Senegal, their baobab fruit smoothies are renowned for their great taste and their medicinal properties in fixing bouts of diarrhea but “the tree of life” has many other uses with a trunk that can grow up to 40 feet in width and hold hundreds of gallons of water. Sometimes the trunks are hollowed out to form large shelters for people while the fibers of the bark are used for rope, roofing material and cloth. In times of drought, elephants will resort to eating the bark as food. For humans, just eating the fresh leaves and white flowers will boost the immune system and provide a salad dish. The black seeds can be used as a coffee type beverage when cooked while the husk of the fruit is a ready made calabash or food container. Along with popularity of the baobab fruit comes increasing trade for many of the impoverished rural Africans. But will demand outstrip supply and will there be any fruit left for the locals? A recent report by the UK-based Natural Resources Institute estimated that the trade in baobab fruit could be worth up to one billion dollars a year for African producers, employing more than 2.5 million households across the continent. One advantage to baobab harvesting is that there is no need for expensive equipment – it is just a question of using your hands – and because the baobab is an indigenous plant, it is better placed to survive in arid climates and not expected to be as vulnerable to any future climate change. Another plus is that earning an income from the vegetation that is already growing virtually in your own back yard provides an incentive to rural communities not take them out the trees in order to plant something else, and so preserving the current soil structure. Called the elephant fruit, the Marula is a yellowy-green specimen fruit, not unlike the plum. The flesh has eight times more vitamin C than an orange, and the nut is also rich in minerals. It forms the base for the South African liqueur Amarula. Native to Zambia, Botswana and Namibia (all countries in Southern Africa), the Mongongo is rich in vitamin E. The dry fruit is often steamed first to soften the skin before the husk is removed. Then the edible red pulp can be used in jams and porridge while the inner nut can be roasted or pressed for oil.